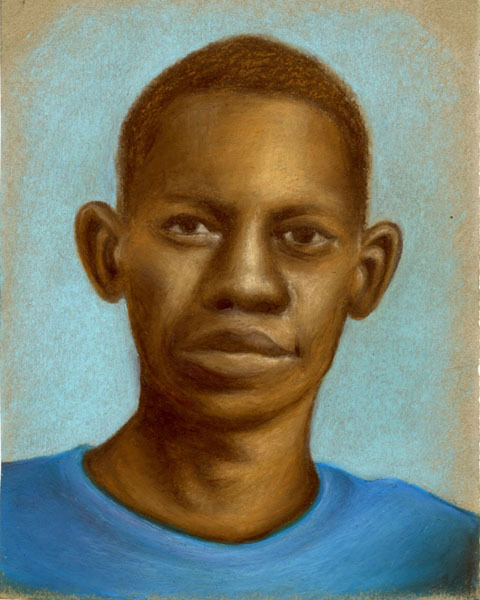 I thought I would try a portrait of a boy in Oil Pastel. He is a relative of the author of the picture book, who lives in the African village. I wanted to test oil pastel on a subject, because Oil Pastel is not so fragile as soft pastel. My biggest concern was to render detail, but this shows it is posssible, and this is a scan, which worked well. I like how the oil pastel looks soft and fleshy. I had to work with the colors I had. Holbein Oil Pastel on 4.5″x6″ sanded brown pastel paper. I’m testing pastels and papers with some of the subject matter I will be rendering. Uart sand paper-like surface, which I brushed water over the first layers of both. 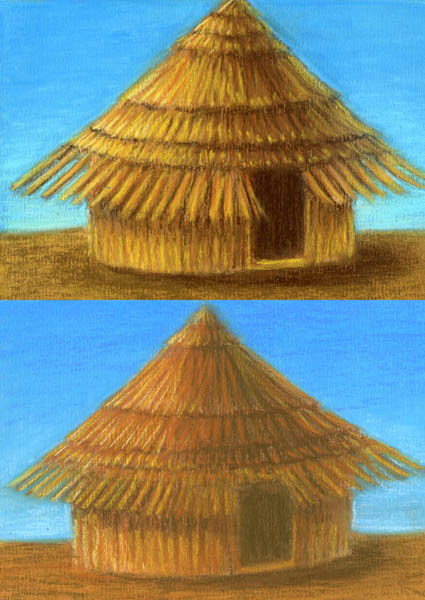 The top hut is Mungyo Semi-Hards and the bottom is Conte Crayons. The Semi-hards clearly have better intensity, but the Semi-hards are a bit wider, 1/4 vs. 3/8, both are square, The problem is, less hardness has better purity of hue, but requires the stick to be thicker. More rough drawings for the picture book, to determine their content. Once they are approved I will do detailed drawings. More Thumbnail sketches for the picture book, they are used to make decisions on what the overall content and composition will be for each page without committing to much time and effort on them until we know for sure how we want the page to look. My Father passed away the Feb 7th, through hospice and a period of mourning, I had to put my work aside for a time. Now I am returning to my normal routine and trying to catch up. In the picture book I’m illustrating about “The Lost Boys of Sudan” this is a page about his family and several people from his village walking to Ethiopia, an arid land with acacia trees. I might need to make the people smaller in proportion to the trees, they are much taller than one might think. David as a boy soldier, this is one option for this pose, I don’t know what emotion should be on his face. A longing for home is what I’m guessing at this point. The next is part of the story I’ll leave as a mystery right now. Here is the finished pastel version on Canson Touch Card, using Mungyo Semi-Hard Pastels. I like the sandy card substrates, the tooth works better than paper, and scans true to there appearance. It ended up looking like some of our local stone outcroppings. Not intended but it works. 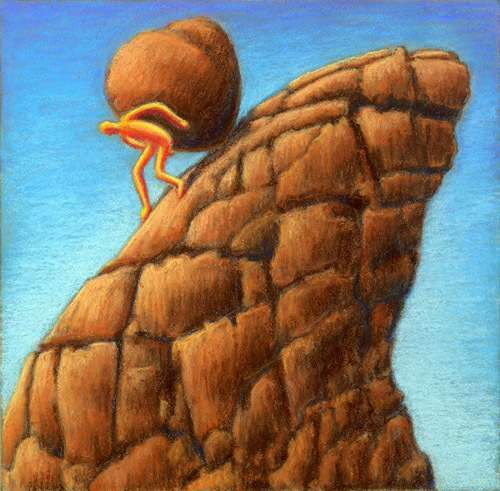 This is a concept sketch for an illustration for a conference. 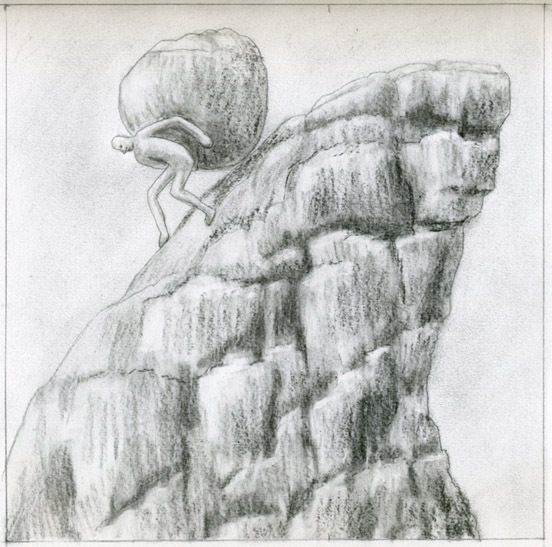 The theme is “Overcoming Inertia.” I drew it from imagination and did a value study to figure out the shading. Net I will do a color version in pastel on pastel card.